This beautiful three-bedroom, two-bathroom property was recently renovated and tastefully furnished. It harmoniously blends retro, rustic and contemporary decorating styles. The kitchen is fully equipped to let you prepare delicious meals like you would at home. 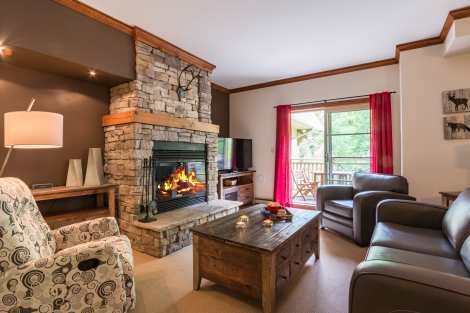 Heated tiles and an impressive stone fireplace keep the indoor cozy on cold days. In summer, a patio with a table and barbecue let you spend even more time in the fresh mountain air. On the second floor, the elegant and spacious master suite with mansard ceiling is equipped with a king-size bed and whirlpool bath. A second bedroom, with queen-size bed, is also on the second floor. The third bedroom is on the first floor, adjacent to a full bathroom. Included are wireless access to high-speed internet, three flat-screen TVs, two DVD players and a compact sound system.